Reduce Hand Injuries in 5 Easy Steps! It’s no secret that hand injuries are one of the leading causes of workplace injuries – one quarter of all reported incidents, in fact! That’s a huge number we’d like to see get smaller with our help. 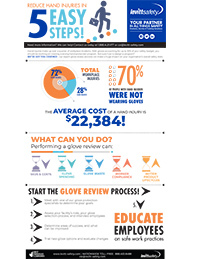 Check out the infographic below to learn how Levitt-Safety’s Glove Review can reduce hand injuries at your workplace in just five easy steps, then sign up for your own FREE review. Yes, it’s free – and it really is that simple!